With all of its life-giving properties, water is not often associated with acts of war. Yet many important interconnections are apparent in modern life. For example, wars are sometimes fought on waterways; those engaged in military operations have many needs for water; war can adversely impact water resources; and increasingly, observers worry that wars might break out due to escalating conflicts over water resources. Many view the idea of global water wars as not possible, whereas others believe such wars are likely. Historically, water has been more of an indirect source of conflict, rather than a direct source or cause for war. However, for millions of people—from Bosnia to Iraq, and from Chechnya to Somalia—water's intricate relation with war is an everyday reality. Water plays a critical role in wars between and within nations. Access to drinkable water is a daily concern in arid regions such as Palestine (shown here) and Israel, where conflicts heightened in 2002. War II. The environmental damage to these marine ecosystems is often significant, ranging from water contamination from ordnance to the massive destruction of built and natural landscapes. During the Vietnam conflict from 1961 to 1975, chemical defoliants were used on approximately 10 percent of the area of South Vietnam so that bombing might be more effective. This use of chemical agents significantly affected the area's water resources. Impacts included contaminated waters, increased runoff and sedimentation, and the spread of malarial diseases due to stagnating waters. The cleared coasts also became more vulnerable to storm damage. Terrorism consists of acts using violence and threats to intimidate for political purposes or personal causes. The people who use threats and violence are called terrorists. Often their targets are public buildings or places. Terrorism utilizing the physical environment, or harming it, is called environmental terrorism. For example, during the Persian Gulf War in 1991, oil spills deliberately caused off the coast of Kuwait resulted in the death of over 20,000 seabirds and severe damage to marine plants and animals. These spills contaminated over 560 kilometers (350 miles) of shoreline, damaging sensitive salt marsh and mangrove swamp habitat . Typically, environmental terrorism refers to acts that damage nature for political causes. However, some use the term more inclusively, encompassing the tactics of extreme forms of environmentalism to "save" nature, such as a radical environmental group burning new homes and buildings to protest their siting on wetlands or coastal areas. Military troops have many water-use needs in field conditions, particularly in arid environments. Water is not everywhere conveniently accessible, even for drinking. The United States military funds research into water desalinization and portable desalinization units to help ensure that its troops will have access to usable water in military situations where water is scarce. Particularly in desert landscapes, obtaining enough water to meet survival needs is of utmost concern. Water infrastructure such as supply pipes, treatment plants, and dams can become a prime target during military operations, leaving local populations vulnerable to water scarcity and water-related diseases. This can be particularly difficult in areas of the developing world, because water is not typically piped into people's homes and must be fetched some distance from the home and carried back. 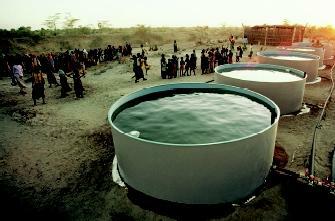 * Increased water scarcity can also compound food insecurity, and therefore human survival. Lack of access to water during military conflict increases the vulnerability of local populations. In many war-torn countries, tanks of fresh water for refugees are in stark contrast to the polluted wells, cisterns, ditches, or streams commonly found in refugee camps. Supplies of clean water can prevent disease outbreaks that often plague people trapped in their homes or uprooted by war. War activities often push local peoples to migrate in search of safer areas. These refugee populations typically are large, sometimes congregating in makeshift or tent cities of considerable size. Movement of displaced populations in situations of conflict is common in the developing world. These tent cities have significant water-related needs for drinking, washing, and cooking, yet have little or no infrastructure to draw upon. The influx of people into an area places great stress on the existing population and resources. 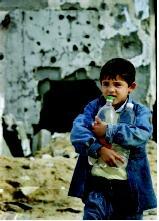 Health crises often accompany war situations, and water-related diseases become a serious concern. Diarrhea is the most common disease. Typhoid fever is also common and has been severe in the Central Asian Republics during recent civil wars. In Dushanbe, the outbreak was due not to a contaminated water source or food supply as is commonly the case, but from the city's deteriorating infrastructure through cross-contamination . Water-supply infrastructure must be maintained to ensure public safety, and this maintenance often breaks down during periods of prolonged warfare. Lingering Damage to Water Access. Widespread access to water is problematic both during and after armed conflicts. Even after wars are over, it is difficult to restore the access to water that existed before those conflicts occurred. In developing nations, local populations have few political and financial resources to guarantee their access to clean water. An example of this is Somalia, where it has been very difficult to restore damaged irrigation systems and to repair damaged dams and dikes . The same has recently proven true in Chechnya and Angola. Humanitarian organizations such as the International Committee of the Red Cross and Doctors Without Borders are concerned with ensuring access to water at all times, including periods of war. SEE ALSO Conflict and Water ; Developing Countries, Issues in ; Drinking Water and Society ; Human Health and Water ; Survival Needs ; Sustainable Development . Simmons, Ian G. Environmental History: A Concise Introduction. Cambridge, MA: Blackwell, 1993. Doctors Without Borders. <http://www.doctorswithoutborders.org> . The International Committee of the Red Cross. <http://www.icrc.org> . * See "Developing Countries, Issues in," "Drinking Water and Society," and "Rain- water Harvesting" for photographs depicting the daily search for water. * See "Survival Needs" for a photograph showing refugees crowding to obtain bottles of drinking water during the Persian Gulf War.